The Øresund Bridge is a combined railway and motorway bridge across the Øresund, a strait between Sweden and Denmark. 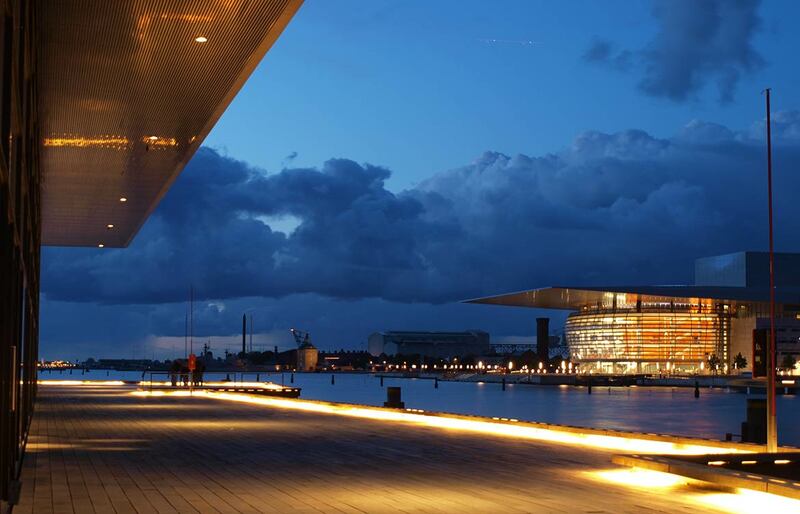 New theater and new opera of Copenhagen at night. Satellite view is showing Denmark, a country in northwestern Europe between the North and the Baltic seas. The Kingdom is located on the Jutland peninsula and several islands, north of Germany. Denmark comprises of the state of Denmark, plus the Faroe Islands and Greenland, both self-governing countries under the sovereignty of the Kingdom of Denmark. The national capital is Copenhagen (København). Official language is Danish. Denmark's only land border is with Germany, it shares maritime borders with Norway, Poland, Sweden, and the United Kingdom. The map shows Denmark with cities, towns, expressways, main roads and streets. Google Maps: Searchable map/satellite view of the Kingdom of Denmark (Danmark).